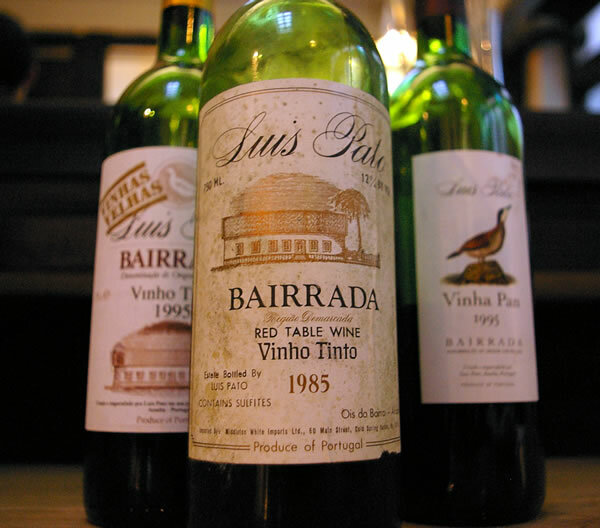 Luis Pato (which is Portuguese for ‘duck’) is the best-known producer in the Bairrada region. He’s widely regarded as the modernizer who brought a struggling region back to life, but I think it’s unfair to see him just in this light, because his wines have a traditional side to them, and he’s also a champion of the local red grape, Baga. Now that the regulations in Bairrada have changed, allowing growers in the region to use other varieties, you could say that Pato is a neo-traditionalist. Baga has a reputation for making rather stern red wines, that are unapproachable in their youth and which often never resolve into mellowness with age. It also makes sparkling white wines which match perfectly with the gastronomic specialty of this region – the famous suckling pig, leitão. While it’s true that Baga can produce rather tannic, fruitless wines that are tough and somewhat joyless, Pato has shown that Baga deserves a bit more respect than it’s often given. I find that it makes wines that share some characteristics with Italian grape Nebbiolo, and it can even approach the elegance of Pinot Noir in riper vintages. Pato shows his open-mindedness in that he was the first overseas judge to participate in the International Wine Challenge, the world’s largest blind tasting held in London each year. He describes this experience as ‘my tasting university’. Altogether he has assembled 65 hectares of vineyards, and makes a range of reds, whites and sparkling wines from 20 separate blocks in various terroirs within Bairrada. His father had 40 hectares, his mother-in-law had 5 hectares, and he has bough 30 hectares, which means that he has rights to another 10 hectares of vines that currently aren’t planted. 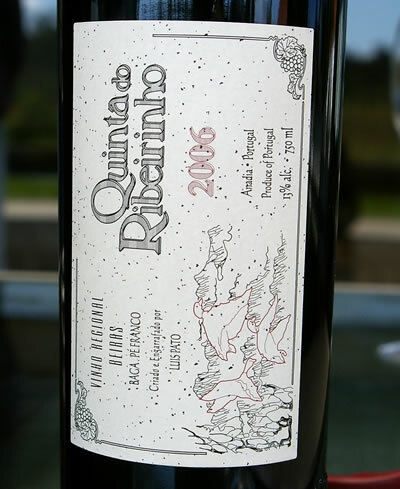 The range is quite complicated, but at its core are four top reds: the Vinhas Velhas, Vinha Pan and Vinha Barrosa, and the remarkable Pé Franco, made from ungrafted vines which Pato recently planted in his Riberinho vineyard. There is also a serious white wine, Vinho Formal, which has an interesting story behind it. 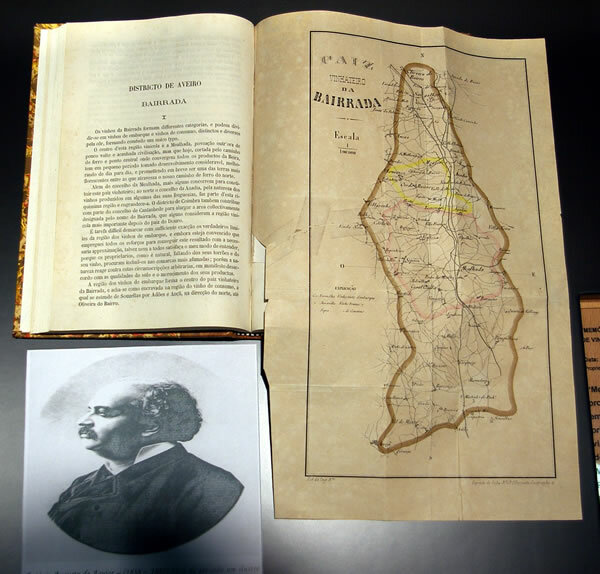 In 1867, António Augusto de Aguiar produced a map showing his Bairrada demarcation, with a yellow line around the bit he thought was best for white wines (this is shown: the map is in the Bairrada museum). Brazil was the important market for Portuguese wines, and for whites to survive the journey, they had to have the structure of reds. Pato decided to trust Aguiar’s map and bought the Formal vineyard, which has chalky clay soils, and the result is this complex, intense, ageworthy white. Pato’s latest theme is that of what he calls ‘precision harvest’. Initially he started doing a green harvest in 1995, in which he removed a third of the grapes at veraison. These days he removes half the grapes: one third at veraison (the usual green harvest), and then later on the balance between a third and a half. This second harvest, of coloured but not mature grapes, is used for the sparkling Baga. He’ll pick the second bunch per stem (the first is the first to grow and is thus more mature). Luis says that his philosophy is ’old world tradition blended with new world precision vinification’. How is the situation in Bairrada? ‘It’s quite difficult at the moment’, says Pato. 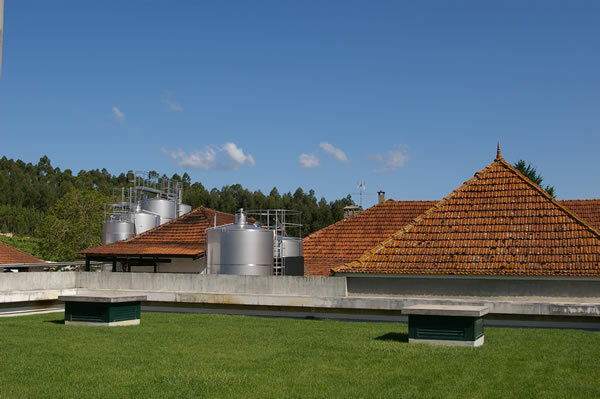 ‘Alianca [one of the big producers in the region] was bought by Bacalhoa a few months ago, and I don’t know whether they will keep the winery. The cooperatives are going down.’ Pato thinks that the future may be more positive, though, because while some of the bad, old fashioned companies are disappearing, new companies are arriving. ‘The future will be white wines, sparkling wines and some top reds’. 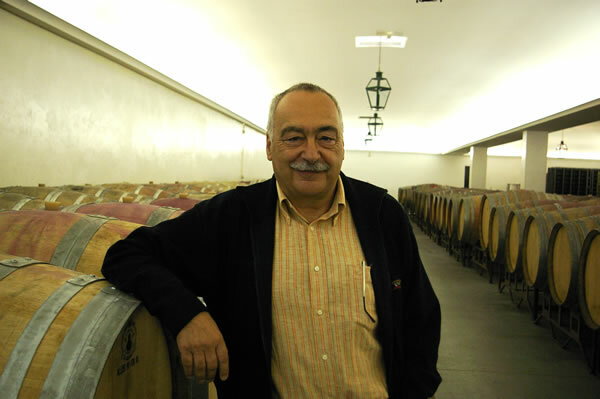 He thinks that to build a good image for the top Bairrada red wines, just 3% of the best red wines need to be kept. 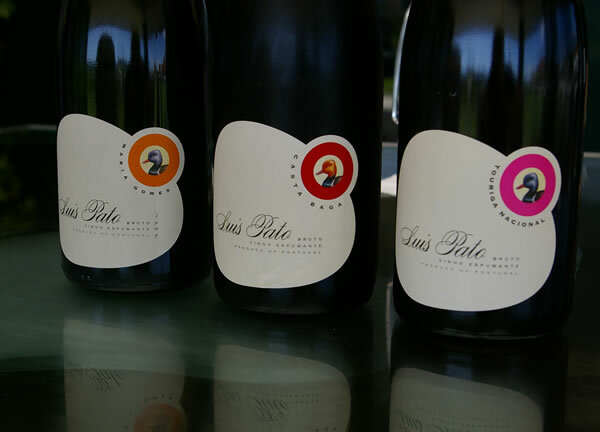 Luis Pato has three daughters, and one of them, Filipa, is now a well known winemaker in her own right. She shares the winery with her father, but makes a quite separate range of wines from both Bairrada and Dão regions, as well as some wines with her husband, William Wouters (she married in summer 2008). Filipa’s wines will be reviewed separately elsewhere. The tasting notes below are from three separate occasions. First, I attended a vertical tasting of his wines in London at Portal, a high-end Portuguese restaurant in March 2008. Then in July 2008 I visited Luis Pato at his estate in the Bairrada. Finally, in November 2008 I tasted through his wines at a tasting organized by the Independent Winegrowers Association (a coalition of half a dozen high end estates which Pato belongs to) at the Bull and Bear restaurant in Porto. First, the espumantes (these are all NV, but the wines here are from the 2007 vintage).